EMV cards feature “smart chips,” which encrypt data for every sale, making card transactions more secure. EMV cards are designed to be inserted into the reader and remain in place throughout the entire transaction. By October 1, 2015, all credit card companies are expected to make the transition to chip enabled cards. Why do I need to adopt to EMV? 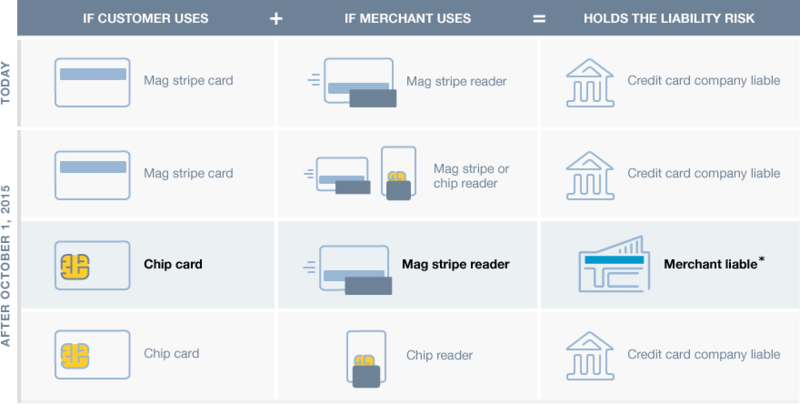 To encourage merchants to adopt EMV-ready technology, merchants who are not equipped to accept chip enabled cards may be liable for transactions from counterfeit or stolen cards during card-present transactions. Starting August 15, 2016, if you process a counterfeit or stolen EMV chip card using a magnetic stripe card reader, you may be responsible for any chargebacks and fees resulting from the fraud. We encourage you to upgrade to QuickBooks Point of Sale Desktop 12.0 and get the EMV Ready PIN Pad as soon as possible to reduce your EMV-related fraud losses when processing card present transactions. Do you sell to customers that you don’t know? Do you sell expensive items? If you accept a fraudulent credit card and can’t collect the funds, would that have a material impact on your business? If the answer is yes to any of the above, you should strongly consider EMV by working with us to update your systems. EMV is only supported in the latest version of QuickBooks Point of Sale Desktop 18.0. To upgrade, call (800) 450-8134. With an integrated QuickBooks Payments account, customers will be able to accept payments using magnetic swipe or chip-enabled cards. The new hardware can accept both magnetic swipe and chip-enabled cards. Need more help with the switch to EMV? Where can I order Intuit's EMV-ready payments solutions for Point of Sale? Will I be liable for losses related to the EMV liability shift? Starting August 15, 2016, if you process a counterfeit or stolen EMV chip card using a magnetic strip card reader in Intuit GoPayment or QuickBooks Point of Sale, you may be responsible for any chargebacks and fees resulting from the fraud. We encourage you to get the new EMV card reader as soon as possible to reduce your EMV-related fraud losses when processing card-present transactions. Do I need to worry about EMV if I do not accept credit card payments in person? If you only key in credit card data instead of swiping cards, you are not affected by the EMV liability shift, but you should always be aware of the ways to prevent fraud when processing online or phone transactions. You may visit Intuit’s online support center for additional resources and detailed information. 1. EMV is a registered trademark of EMVCo LLC in the United States and other countries. 2. The EMV Ready PIN Pad is sold separately and requires: (1) QuickBooks Payments account, (2) QuickBooks Point of Sale Desktop 18.0 software, (3) internet access or modem and phone line (sold separately), and (4) printer (sold separately). NOTE: EMV chip debit cards can only be processed as PIN debit transactions using the magnetic stripe card reader or as credit transactions using the EMV card reader at this time. This EMV Ready PIN Pad is currently unable to process EMV chip debit cards as PIN debit transactions using EMV card reader. QuickBooks Payments account subject to eligibility criteria, credit and application approval. See Important Info, Pricing, Acceptable Use Policy and Merchant Agreement. Terms, conditions, prices, payment, features and services are subject to change.